Anguil Environmental Systems was selected to provide the air pollution control system for the University of Nottingham’s new pilot-scale carbon fibre recycling plant.Nottingham University and its industry partners set out to develop and commercialise recycled fibre that maintains the material’s strength at a cost saving to manufacturers using carbon fibre in their products. The team at Nottingham knew that an air pollution control device would be necessary to meet the local emission requirements for hydrogen cyanide (HCN) and ammonia (NH3). 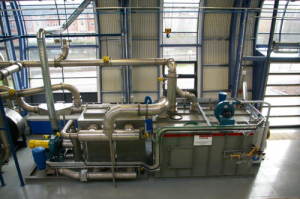 They also saw potential to reuse some of the energy released during the combustion of these carbon fibre processing emissions.Anguil Environmental Systems was selected to provide a 1,500 SCFM (2,548 m3/hr) Thermal Recuperative Oxidiser with dual heat recovery. 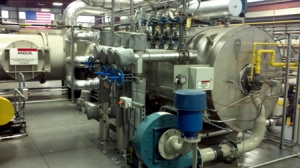 A stainless-steel heat exchanger within the oxidiser reduces the amount of supplemental fuel required to bring the process emissions up to combustion temperatures. In addition, a secondary heat recovery system downstream of the oxidiser captures 95% of the remaining heat. This is enough energy to preheat the air for the process equipment. When in operation, no external heating source is required to fuel the Anguil oxidiser or carbon fibre oven, making the entire system self-sustaining.The Anguil oxidiser has been achieving over 99% destruction rate efficiency at the Nottingham facility. Anguil also supplied similar systems to treat the exhaust streams and recover heat from the carbon fibre line at Oak Ridge National Laboratories (ORNL), in Oakridge, Tennessee, USA.This facility allows commercial partners to test the scalability of emerging carbon composite materials before commercial production (see ORNL makes low-cost carbon fibre available to US companies).